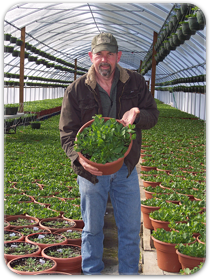 HB Farms & Greenhouses was established in 2000. It is a family owned and operated business located in scenic Floyds Knobs area. We began as a small farm growing spring vegetables that were sold at a local farmers market. Our first year also included pumpkins, gourds, and a small fall mum crop. Our first year's Mum crop was grown in the ground and dug just prior to sale. The pumpkins and gourds were a nice compliment to our mum crop. These were marketed on a main route to a local attraction. Our first year included 2500 mums and 3 acres of pumpkins and gourds. It was evident after our small beginning that there was a need for quality mums. We expanded in the second year and grew 12,500 mums and 10 acres of pumpkins. In the second year, we grew the bulk of the mums in pots as opposed to in the ground. This was the initiation of our wholesale operation. After acquiring several wholesale accounts, the 2001 crop was marketed with relative ease because of the unmatched quality HB Farms produces. Almost immediately, it was clear that there was opportunity to expand our wholesale operation. In 2002, HB Farms raised 50,000 mums which were distributed to over 40 wholesale accounts. Our mum planting has continued to grow and is now in excess of 70,000 annually. Perennials were added to our offerings in 2004 in an effort to provide a better-rounded program to our customers. There were approximately 4500 one gallon Perennials spanning about forty varieties the first year. This has grown to 10,000 Perennials annually. In 2005, HB Farms added Petunias to our menu of offerings to further our spring selection. We grew 2500 in 2005 and, as of 2011, offer 20,000 hanging baskets and patio pots. We are the largest Petunia hanging basket grower south of Indianapolis, Indiana. Our operation has grown to two different sites spanning over 15 acres of land. This includes 27,000 square feet of greenhouses and 233,000 square feet of black cloth mats. Our spring crop is started in the greenhouses and moved outside onto the black cloth mats as weather permits. Our fall crop, composed primarily of mums, is grown in the field on the black cloth mats from start to finish. Contact HB Farms today to inquire about setting up a wholesale account.